It is getting to be that time of year. I have seen some posts asking how people heat thier shop in the winter. I heat mine with both electric heat and a wood stove. 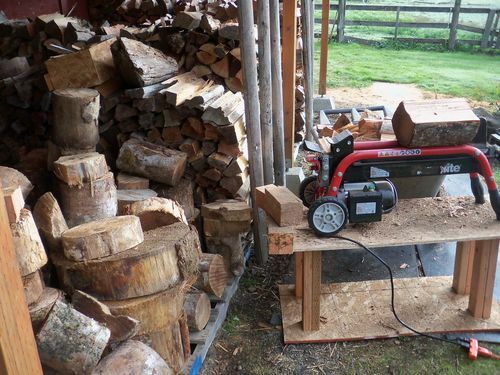 Last year my brother loaned me his Homelite Electric Log Splitter to split my firewood. The maul and sledge hammer is just not a much fun as it used to be.
. They sell for $299.00 at Home Depot (and free shipping). Most gas units start at about $1200 and go up. What I liked was how portable it is. You can move it around like a hand truck on its wheels. It is completly electric which means quiet with no gas to burn. You could use it indoors if you want. It has taken any and all logs I have put on it. I have rented and borrowed much bigger gas log splitters over the years. They are no faster or easier than this one. It is very safe. It requires two hands to operate the ram. One hand on a button and one hand on a lever. You have to stand on the left side of the ram so any wood which might fly off goes well away from you to the right. This is my second year using one of these units and I cannot find anything wrong with it. Five Stars for sure. That looks pretty good… if you split a lot of wood! 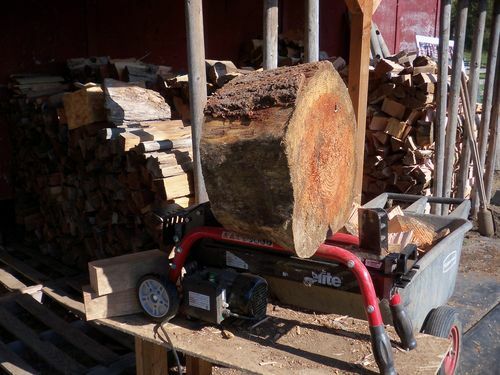 How do you really break that last log up where the diameter so much larger than the cutter? Go all the way around it cutting slits… then what? Sure is a REASONABLE price for what you get out of it… Look like you really cut a BUNCH of wood! I have been considering a splitter for a while now. Never considered an electric one as I assumed they did not have enough power. You have made me reconsider….thanks for the review, I may retire the maul and splitting wedges. I am also surprised that 5 ton was more than a toy. Did it REALLY split the stump that’s loaded? The book on this splitter says 20.5inch max length and 10inch max diameter (the web site says 12inch max diameter). The wood on the last photo was split easily. It is dry douglas fir. That was the biggest I have split and not the norm. Usually 20inch diameter and under. The Home Depot web site had 69 customer reviews with an average rating of 4 1/2 stars out of 5. There is not much fun in doing your own fire wood but if you want to do it and make it easy as possible. This unit may be it for the cost. What’s a shoulder xray cost these days. For $300 bucks, this one’s in my cart! Wow. I really never considered the electric either. $299 i can do. $1200 is an investment that I have put off for some time. Thanks for the review. I just bought mine 2 weeks ago and love it also. Have cut up 2 cords with ease. This tool is a ton, (maybe 5 tons) of fun to use. Now I just need some more space in my backyard for the wood I plan to split. Looks like I will have to look into getting one. Burning wood should be illegal. Make something out of that beautiful wood and then burn the scraps! After splitting 3 cords with a mall last year a power splitter was on top of my list. After reviewing the different machines I ended up with this same splitter. Love it! After reading your review I decided to buy one, I split about 2 cords a year so only need it occasionaly. Just passed 70 and can no longer swing a mall. Bought one at HD for $299 came home put the wheels on and took it out to the wood pile. Split about a half cord in an hour, this little thing really splits wood, all my wood was dry. Tried afew 12,14 inch dia. and it split them with ease, it still looks like a toy but I am pleased and suprised with this splitter. I, too, have one and it splits most of the wood I put on it but for some strange reason it will not split Sycamore! I have possession of a 5 ton electric unit that was given to me. It will only split soft woods. I have the $1000 gasoline unit that produces 20 tons. It does well on oak. In my part of the country we try to burn oak or pecan. I have split a little elm and some sycamore on it. The elm is just plain nasty to split. If the logs are very large it can’t handle the elm. We cut everything to about 20 inches long. Just my experience. BTW I have a friend that splits all his with a wedge and a hammer. He was 90 last July so I am not sure we shouldn’t go to that and get in shape before we begin….... Nope sticking with my 20 ton hydraulic.